Hvor vigtigt er klimaet for vælgerne? I en ny meningsmåling foretaget for tænketanken Concito vises det, at klimaet er det vigtigste emne for vælgerne. Dette er dog ikke uden væsentlige forbehold. Min første bekymring, da jeg hørte om meningsmålingen via en journalist fra Mandag Morgens TjekDet, var, at respondenterne i undersøgelsen nok var stillet andre spørgsmål om klimaet forud for spørgsmålet omkring, hvilket emne de fandt vigtigt. Dette ville føre til, at de ville finde klimaet vigtigere. Det viste sig også at være korrekt, at respondenterne havde fået stillet spørgsmål omkring klimaet forud for det relevante spørgsmål. Dette gør at undersøgelsen ikke er retvisende, hvilket jeg har udtalt mig om sammen med andre forskere. Artiklen kan findes her. Tidligere indlæg om samme emne kan findes her, her, her og her. At what age are people considered old? That is a great fit, i.e. the overlap between the blue and the orange line, but is it true? 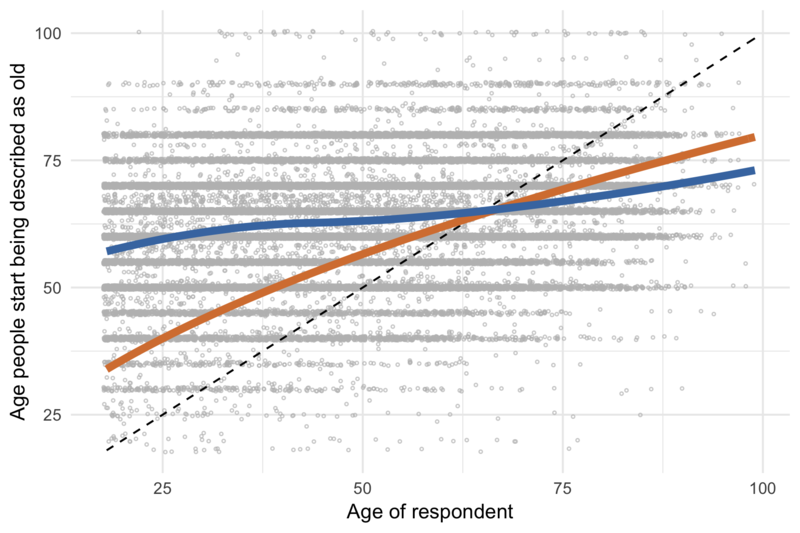 A follow-up tweet describes that the figure shows the answers from ~200 people. That is not a lot. In this figure we do not see as great a fit as in the other figure. For 18-year-olds the average answer is 57 years. For 25-year-olds the average answer is 60. 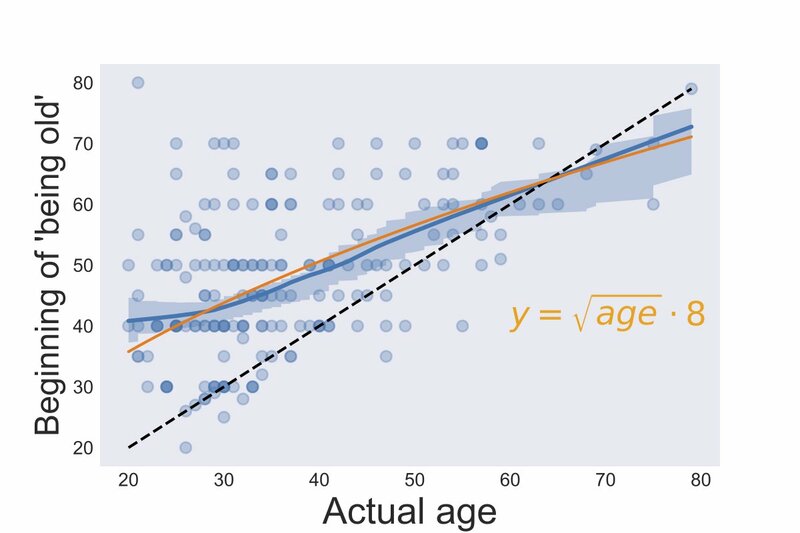 This is far from the estimates we get with the square-root of the respondent’s age times 8. The lesson? Do not overfit your model (especially not to your N≈200 sample). The study also got some attention back in 2016 when it was published (see e.g. The Guardian). This is not surprising as the study presents experimental evidence that people who are randomly assigned to not using Facebook felt better with their lives on a series of outcomes. The only problem is that the study is fundamentally flawed. The study finds that people who did not use Facebook for a week reported significantly higher levels of life satisfaction. 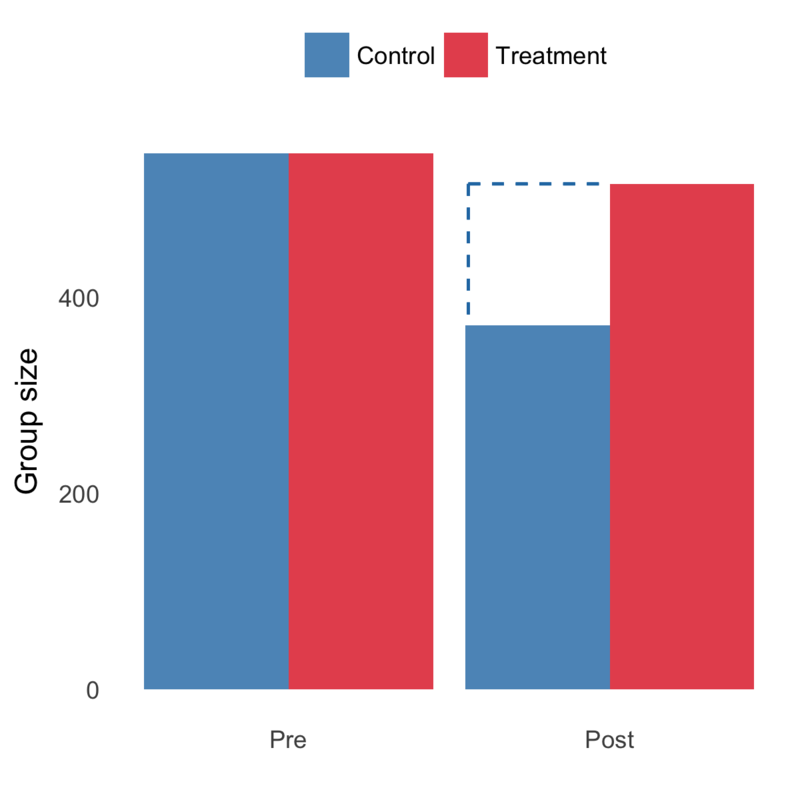 The design relied on pre and post test measures from a control and treatment group, where the treatment group did not use Facebook for a week. The problem – and the reason we should not believe the results – is that people who took part in the study were aware of the purpose of the experiment and signed up with the aim of not using Facebook! In short, this will bias the results and thereby have implications for the inferences made in the study. Specifically, we are unable to conclude whether the differences between the treatment and the control group is due to an effect of quitting Facebook or is an artifactual effect. First, when respondents are aware of the purpose of the study, we face serious challenges with experimenter demand effects. People assigned to the treatment group will know that they are expected to show positive reactions to the treatment. In other words, there might not be a causal effect of not being on Facebook for a week, but simply an effect induced by the design of the study. An example of the information available to the respondents prior to the experiment can be found in the nation-wide coverage. The article (sorry – it’s in Danish) informs the reader that the researchers expect that using Facebook will have a negative impact on well-being. Second, when people know what the experiment is about and sign up with the aim of not using Facebook, we should expect a serious attrition bias, i.e. that people who are not assigned to their preferred treatment will drop out of the experiment. In other words, attrition bias arises when the loss of respondents is systematically correlated with experimental conditions. This is also what we find in this case. People who got the information that they should continue to use Facebook dropped out of the study. Figure 1 shows the number of subjects in each group before and after the randomisation in the Facebook experiment. In short, there was a nontrivial attrition bias, i.e. people assigned to the control group dropped out of the study. The dashed line indicates the attrition bias. We can see that the control group is substantially smaller than the treatment group. These issues are problematic and I see no reason to believe any of the effects reported in the paper. When people sign up to an experiment with a preference for not being on Facebook, we cannot draw inferences beyond this sample and say anything about whether people will be more or less happy by not using Facebook. There is a lot of new and interesting academic research coming out every day. Working papers, book chapters (you can usually ignore these), journal articles, books etc. So, how to stay up to date on all this new research? Here are my personal recommendations. First and most importantly: Twitter. This is by far the easiest way to keep yourself updated. You don’t need to (re)tweet or in any other way engage in the conversations on Twitter, but you should at least have an account and follow your favourite scholars1. Luckily, it is impossible not to hear about new research from a person if you follow that person on Twitter. Furthermore, people are usually good at tweeting about interesting research similar to their own interests (which hopefully will overlap with your interests). That also brings us to the challenge of using Twitter: information overload. The more people you follow on Twitter, the more difficult it is to ensure that you notice the tweets relevant to you. It is very easy to follow new people on Twitter. Good Twitter use is not about following as many researchers as possible but about optimizing the signal-to-noise ratio, i.e. seeing more relevant tweets and less irrelevant tweets. While there is an overlap between the different lists, they can structure your Twitter use and make it easier to stay up to date on what is going on compared to one major feed with everybody, especially if you are offline or busy not being on Twitter for multiple days and eventually have to catch up. You can read more about lists on Twitter here. Second, Google Scholar. An important feature of Google Scholar is that you can follow researchers, articles and key words (so-called email alerts). If you follow a researcher on Google Scholar, this will give you a mail notification when the person has new research. You can also follow citations to that persons, i.e. get mail notifications on the new research that is citing work by the person. Within any scientific subfield there is usually a review piece or two that everybody cites. It is a good idea to sign up for notifications in relation to those articles so you get a mail when there is new work that cite this work. Last, if you work with specific concepts it is a good idea to follow such key words as well. Third, journal RSS feeds. This was my main method for years, basically getting notifications about the most recent number of a journal and/or articles available in advance/FirstView. I still follow the journals but it is getting less useful for three reasons. First, there is a heavy delay so you have often seen the work months (if not years) in advance of the actual publication (especially if you use the two methods above). Second, there is an overlap with the above methods, so if anything relevant is coming out, you can be sure that it will reach your Twitter feed. Third, going back to the signal-to-noise ratio, the more generic journals you follow, the more irrelevant research will end up in your feed. These are just a few of the ways in which you can find new research (again, my recommendations). If you want another example on how you can find new research in line with your interests, see this tweet from John B. Holbein (he usually tweets a lot of interesting political science research).